Saturday sessions can compliment any training plan and are a great way to enjoy a group workout. 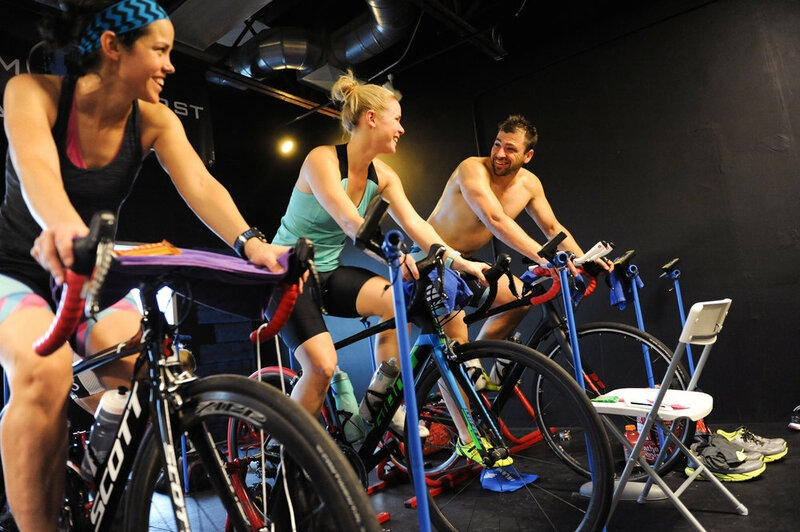 If you have questions about adapting our weekend + holiday rides to your training, we’re happy to help. Contact us. For outdoor group rides on weekdays, see BAM Endurance group training & events. At BAM HQ, all you need is your bike. We have several Wahoo KICKRs and CompuTrainers you can reserve for weekend rides. Power-zone based sessions developed by Wes Johnson and Max Testa, MD. All you need is a bike! Reserve one of our KICKRs or CompuTrainers for each class by clicking [Sign up] in the list of available classes below. Once a class is full, it will disappear from the list. Early winter sessions start at 2 hours and progressively get longer as we get closer to racing season. You can adapt the length you stay to your target race/event distance. If you have any questions, feel free to ask your coach or one of ours. We're happy to help! Remote Access (joining by video conference), workout files and recordings (to watch on your own time) are available to Power Program subscribers. Power Program subscribers: weekend classes are included as a bonus in your membership. Log in to the Online Portal and view RSVP: Weekends to book your spot for free. Outdoor, flexible durations (2-5 hours, depending on your training), starting in various locations. Sometimes we climb canyons (Emigration and Big Cottonwood are favorites) and sometimes we find flats. Subscribe to our email list (bottom of this page) and join the BAM Endurance Club Facebook Group to get word on when and where we're meeting each week. We love our indoor power work, but we like to get out as soon as the roads are clear! Some of the BAMFAM at Rock Cliff Park on the Jordanelle Reservoir in Park City, UT. It's Thanksgiving! Choose your own adventure ride. Each item had its own set. Earn your calories! For big meals in the winter and grillouts in the summer, join us holiday mornings for solid workouts that keep your training on track. Thanksgiving, Christmas, New Years, Memorial Day, July 4th, Pioneer Day, Labor Day -- these are holidays when we typically host special rides. In the summer, we'll often start the day with an open water swim at one of our many regional reservoirs, and then change gear and ride. Planning is contingent on a number of logistical factors, including weather. We do our best to lock down plans 1-2 weeks before each holiday. If nothing is listed below, join our Facebook Group to stay in the loop. Current Power Program Subscribers, Endurance Club members and Coaching clients typically receive preferred rates for group events.